Look at Me! Leave Me Alone! Dana Zemack has been making stick figure comics since she was 12. This week, she made one just for us. This week I had the pleasure of watching a beautiful TED talk by Susan Cain called The Power of Introverts. 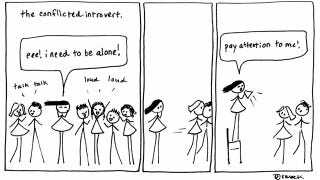 According to Cain, who is the author of a recent book about introverts called Quiet, the world is designed for extroverts, even though 1 out of every 2 or 3 people are introverts. In her talk, she celebrates the many special qualities that introverts bring to the world. I am an introvert around 95% of the time. During the remaining 5%, I am not only an extrovert, but may well be a total narcissist. That 5% wants the world's love and undivided attention and as many Facebook likes as possible. To be clear, the second half of this post, which is all about me, was written by that 5%. Me! Please let's talk more about me. See all of Dana's stick figures at danavore.tumblr.com. Or follow her on Twitter.